Entertainment has become an essential part of the web. Numbers of technological developments have taken place for entertainment growth. Online game development is one of such technological advancements. Apart from music and movies, online gaming is rapidly increasing over the web. Off late, many social networking websites have introduced gaming in their websites to raise user interactivity. Looking at the present scenario, game development is acting as a valuable medium for entertainment as well as brand promotion. A lot of programming and creativity is required in order to develop good games. The advanced technology in games development has now, made it possible to play with people from all across the world. Game developments have transformed a lot from the primitive times when game development took place only in action scripts. Promoting or advertising a product or service through mobile games is highly being accepted worldwide. Consumer product-based companies have chosen pc game development and mobile game development to advertise their products. The reason behind this is that the market of mobile games development is huge in demand and advertisements can reach the target audience in no time and at reasonable price. Net surfers have been discovering online games intervened by compelling content, community aspects and interactive experience. Mobile games development has come a long way from simply being pastime to becoming excellent multi-dimensional with cutting-edge technology. A few years back, PC game development was much more in demand but nowadays, mobile games development is giving a neck-to-neck competition. 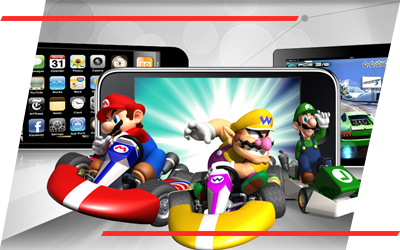 With 3D graphics and multi-player motions, mobile gaming has come a long way beyond anybody’s imagination.